Just read this article on the Guardian blog, finally we are being acknowledge by fashion designers, even thought layering is not a challenge anymore.. I think Kuwaiti girls have mastered the art of layering up, following the latest trends while still looking prim and proper ! "It's 2012. We're bored to death with debates about the hijab. Why women wear it. Whether they are coerced into it. "Oh, but I bet they have a lovely head of hair under there". SNORE. 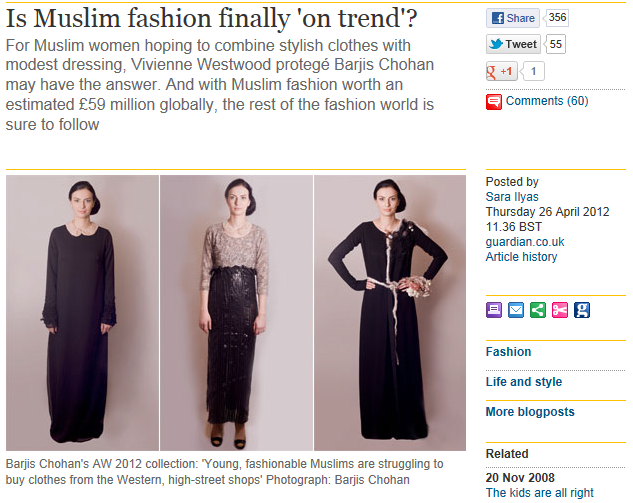 All this talk neglects the role of fashion in the hijab's popularity. It's just easier to be a fashionable Muslim in Britain these days – walk down Oxford street and stereotypes of the hijab as bland and restrictive are laughable. There are gaggles of friends wearing bright leopard print H&M shawls as a hijab, girls with a mountain of fabric piled up to create a beehive style hijab - hell, I even saw a lady wearing a glittery blue cardigan as a headscarf once (I saw the sleeve hanging out)."